EZInlays must excel in these three critical pathways in order to Create Memorable Customer Experiences and to Increase Adoption Rates. Addressing these pathways is essential to ensure EZInlays has a right to exist in the marketplace. The phrase I’ve heard most often, while demonstrating how to build an inlay, goes something like, “I can’t believe how easy that looks”. The following activities supports and inspires the customers belief while nudging them to take action. Provide training materials in both written step by step documentation and instructional videos. Create instructional videos and written documentation for each EZInlays design. Add content to the Tips and Tricks portion (FAQs) of the web site. There are 30 subjects identified for development. Live presentations / demonstrations at stores like Woodcraft, Rockler, or ??? Hold Make-n-Take events, a crafting activity following the lines of the Paint and Sip business model. Market possibilities through imagery and educational materials disperesed via social media platforms. Create email marketing chains and enlist subscribers. When purchasing new tools customers want to be assured their purchase has value. Demonstrating possibilities of what can be created, with an inlay building kit, inflates the value to cost ratio for tool investment dollars. 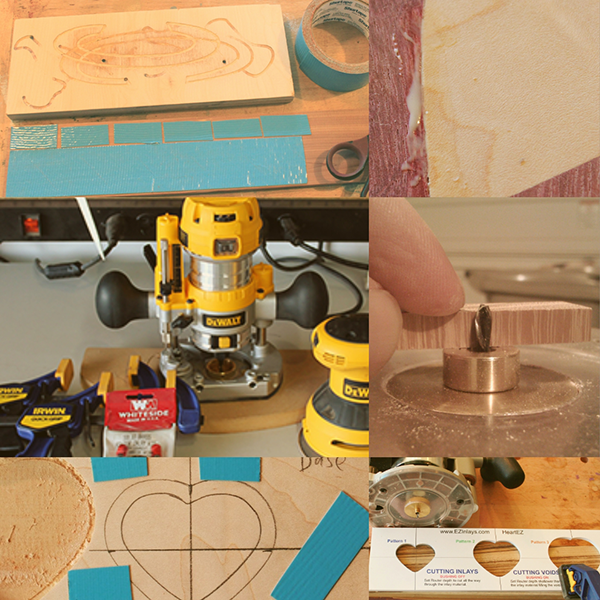 These activities support the Educate pathway by providing possibilities of what can be created when using a plunge router as a hand held CNC machine. Create home use CNC projects and instructions. Create Train the Trainer educational materials. Explore franchise opportunities for crafting with exotic woods experiences along the Paint and Sip business model. A critical task to achieving these goals is identifying and securing supply, manufacturing, and distribution solutions. Current manufacturing needs include the of procurement of templates and packaging materials. We have been sole sourcing template manufacturing through Jonco for the last 3 years. Packaging materials can be produced by any print shop. Current distribution methods include Amazon and sole sourcing. We would like to add a store like Woodcraft, Rockler, or Eagle America to the network. Limited capability to create wood material kits in my garage. Each wood kit is specific to the design being built. Selling double sided tape, glue, sandpaper, and other types of shop consumables. Selling one time purchase tools such as the Whiteside Brass Inlay Kit or a plunge router. EZInlays main advantage is our diversity of products, designs, and making use of a plunge router. Currently we are the only company in the space using inlay techniques to craft exotic woods into heirloom quality Christmas Ornaments, Coasters, and Coins. Our CrafterEZ kit allows us to provide multiple options for the center of a coaster. While diversity of product is important sooner or later the competition will do the same thing so we must continue to grow our assortment of options, designs, and possibilities. Our CrafterEZ template also serves as an introductory to woodworking template. We will be the only company in the space offering an inexpensive way to get hands on woodworking back into schools as a STEAM kit. We will dominate social media market share by hosting Make-N-Take events; a hands on crafting event where the participants make and take home a set of coasters or Christmas ornaments. We will tap into the trend of hands on do it yourself crafting experience to gain a share of the social media market in the crafting with wood area.